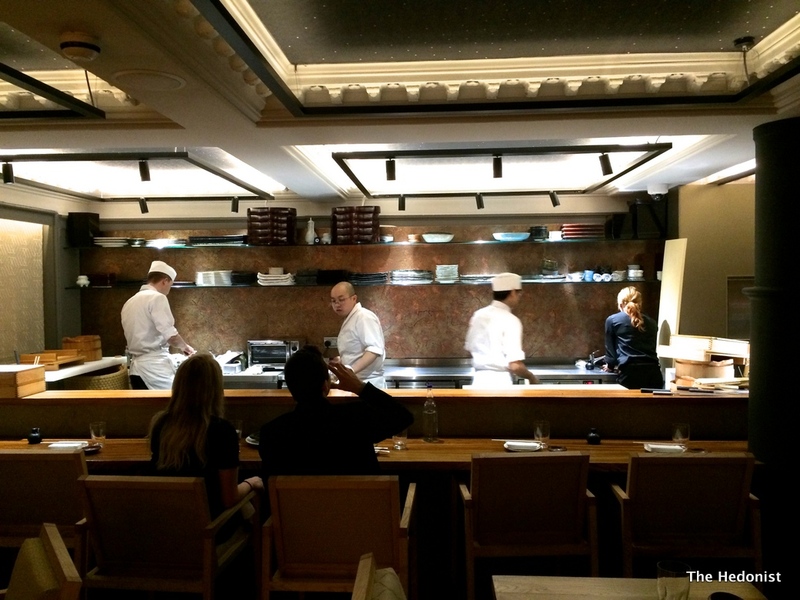 It is fascinating to watch the London Japanese restaurant scene mature with chefs from top-end joints starting to branch out on their own. Ex-Zuma head chef Ross Shonhan has added a rock’n roll vibe to the burgeoning West End ramen noodle scene with Bone Daddies and brought stuffed Taiwanese buns to our attention in Covent Garden at Flesh & Buns. At Kouzu another Zuma alumni, chef Kyoichi Kai from Kyushu in southwestern Japan, has decided to stick to the high-end of the market, and we have been asked along to review. 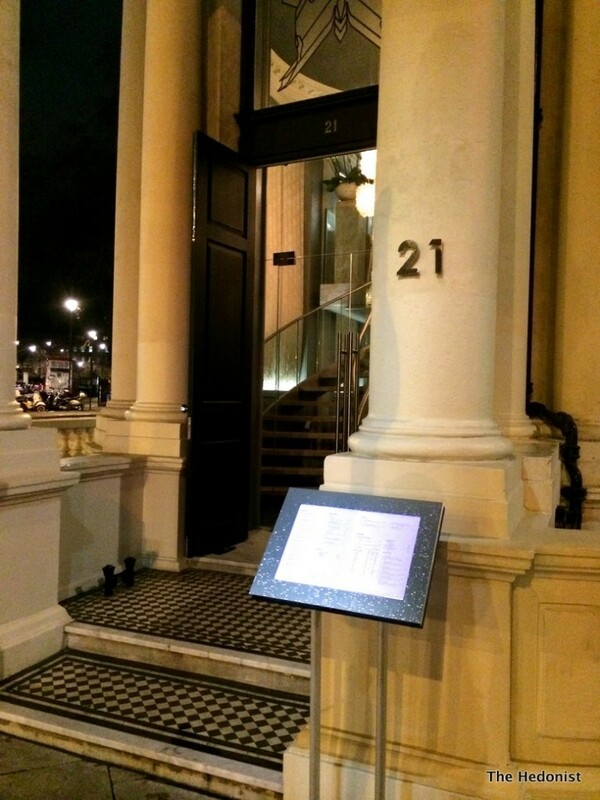 Situated a stone’s throw from the hustle of Victoria Station, the restaurant sits on the Belgravia boundary with interiors that are a mixture of functional Japanese restraint and luxe glamour. 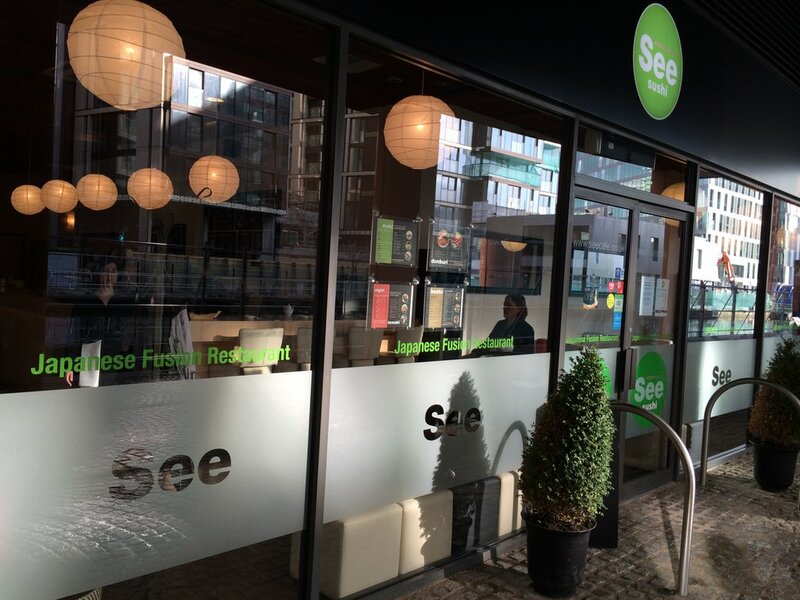 There is a mezzanine sushi bar and a ground-floor cocktail bar as well as the main restaurant area which gives a flexibility to your dining options; new lunchtime and pre-theatre menus will add to that. 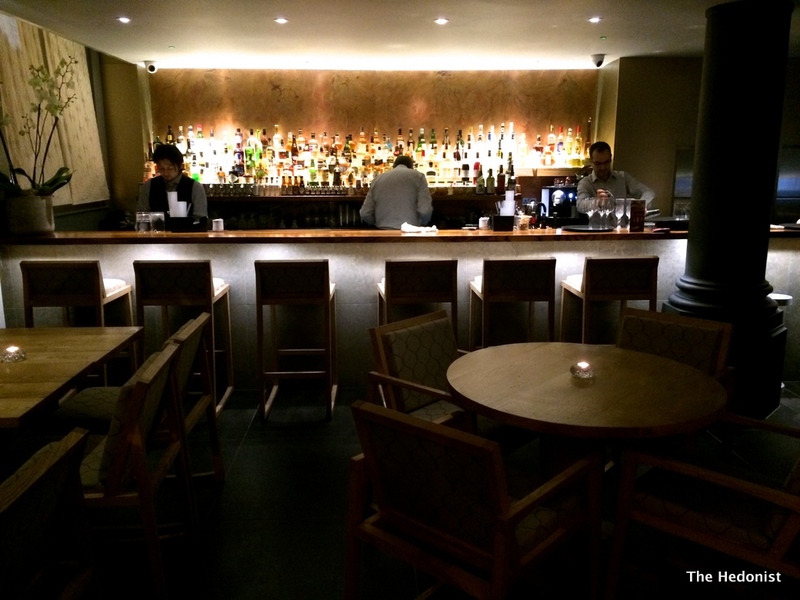 The menu is in the same ballpark as Dinings, one of my favourite Japanese London restaurants, and offers a contemporary take on the cuisine fusing traditional elements with western influences and produce. We order a couple of cocktails; the Yuzu Bellini (£12) is dry and crisp with the sharp, citrus tones of the yuzu perfectly balanced with the fizz. 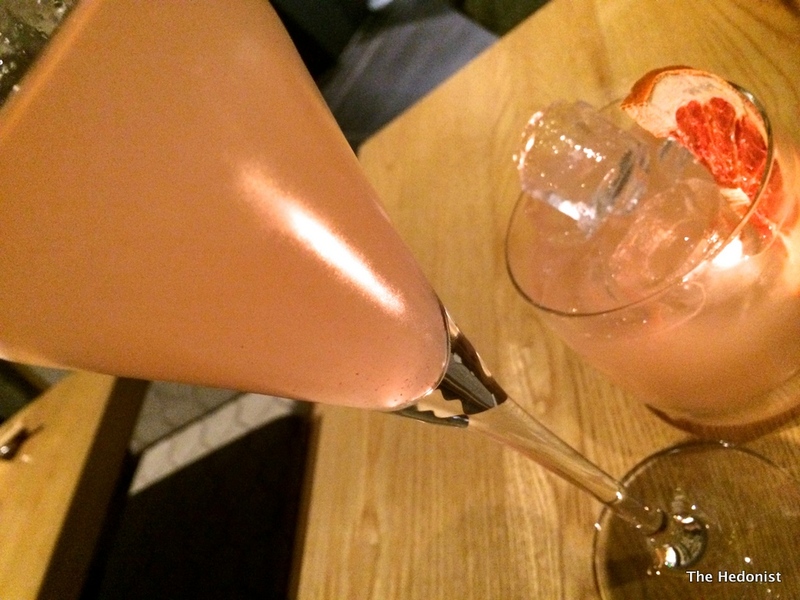 A Pink Grapefruit Margarita (£9,50) is similarly well-mixed and unsweetened and both are perfect for wetting our appetites. You could coat my Chelsea boots with truffle and I would probably eat them. Yellowtail with truffle dressing (£15) was really delicious, the delicate fish marinaded and infused with the gorgeous flavour of the tastiest of tubers and set off by the allium crunch of the micro-salad garnish. My dining partner announced that her foie-gras and spinach with teriyaki wasabi (£12) was a phenomenal dish. 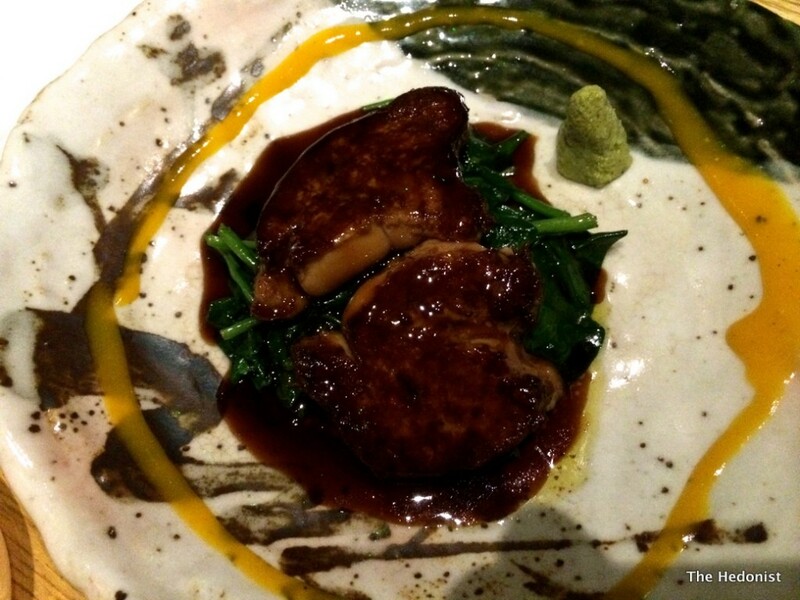 The seared foie had great flavour and the teriyaki wasabi sang with an umami spicy, savoury richness. 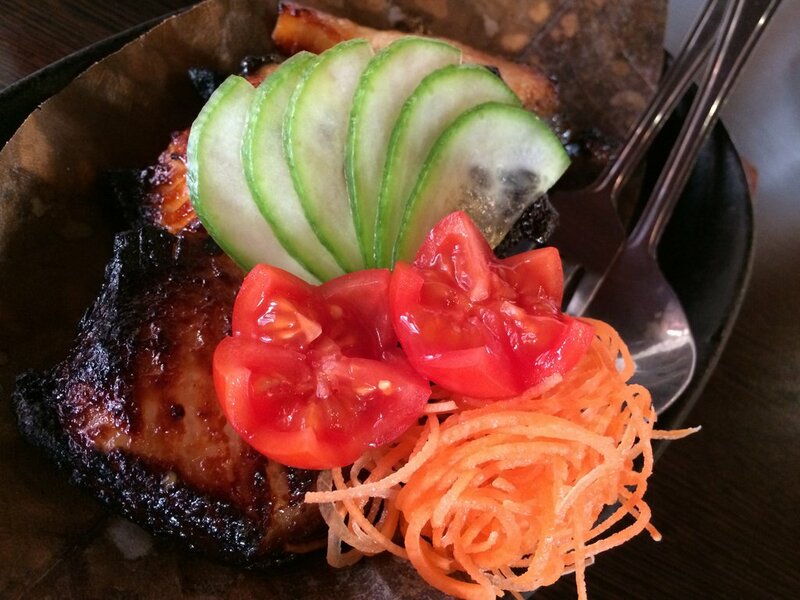 Kouzu specialises in ‘Aburi’ sushi-it’s a nigiri sushi (fish on top of rice) with a partially grilled topping. Aburi O-Toro (£8.50) used the fatty toro piece of the tuna belly which is the most prized part. The tuna and the shrimp Aburi Botan-Ebi (£7.50) were both soft, silky and smokey. This way of preparing sushi was new to me and the grilling of the fish completely changes the taste perspective of the dish. 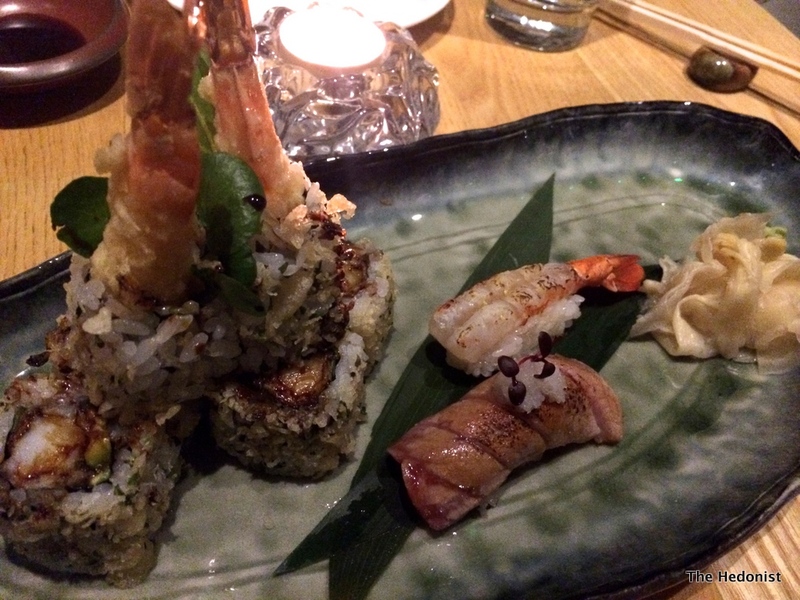 Prawn Tempura Roll (£10) had a light, crisp texture with the whole roll being lightly fried. 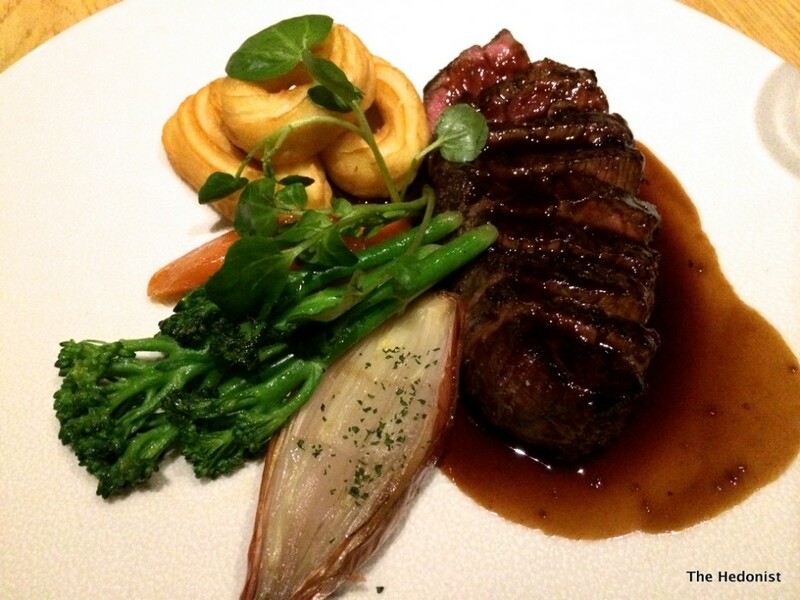 Beef fillet steak (£31) was really tender and full of flavour coming with a deeply reduced red wine sauce, and beautifully crisp veg. 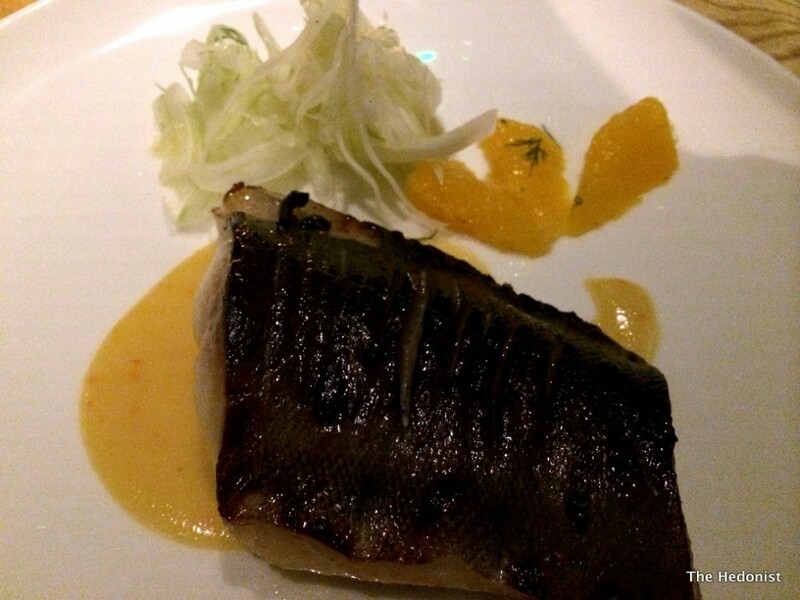 Roasted Black cod (£28) had a subtle citrus flavour that brought out the sweetness of the fish. I love black cod and this is a different take to those early iterations of the dish available at Hakkasan and Nobu that established it as a London staple. 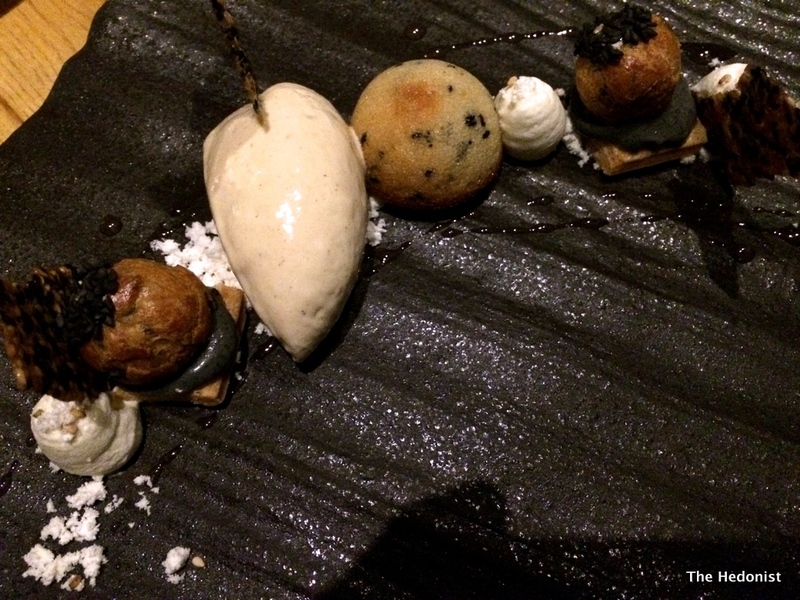 The desserts at Kouzu are fascinating combining unexpected savoury elements with the sweeter. 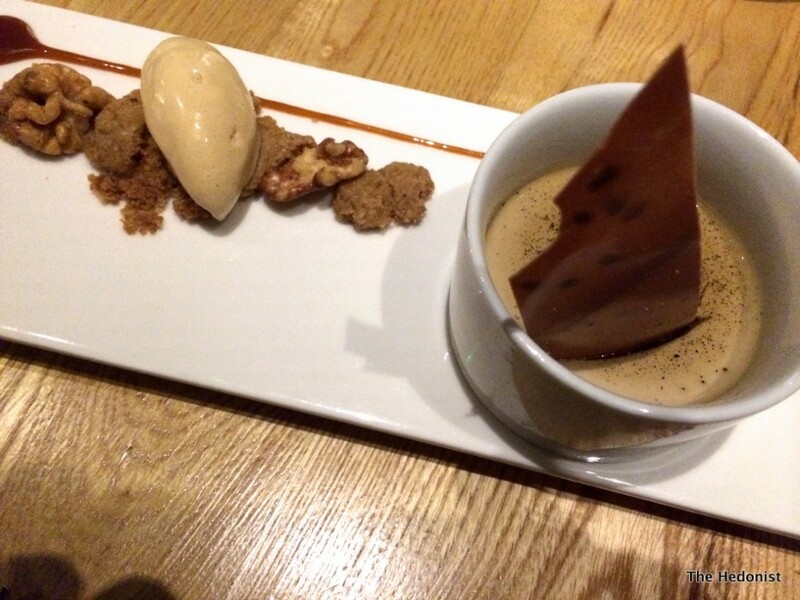 Goji tea creme caramel had an almost seaweed flavour-it was light and frothy but offset by the rich sweetness of the salt caramel ice cream. A honey and sesame plate with sesame ice-cream had savoury textures barely sweetened by the honey.This was a very satisfying dish. There is a seriousness of purpose about Kouzu that I really enjoyed and a commitment to flavour,texture and composition (Kouzu means composition in English) that manifests itself through the whole experience. It is a more intimate space than Zuma but less cramped than Dinings and delivers a level of dining equal to both of them. 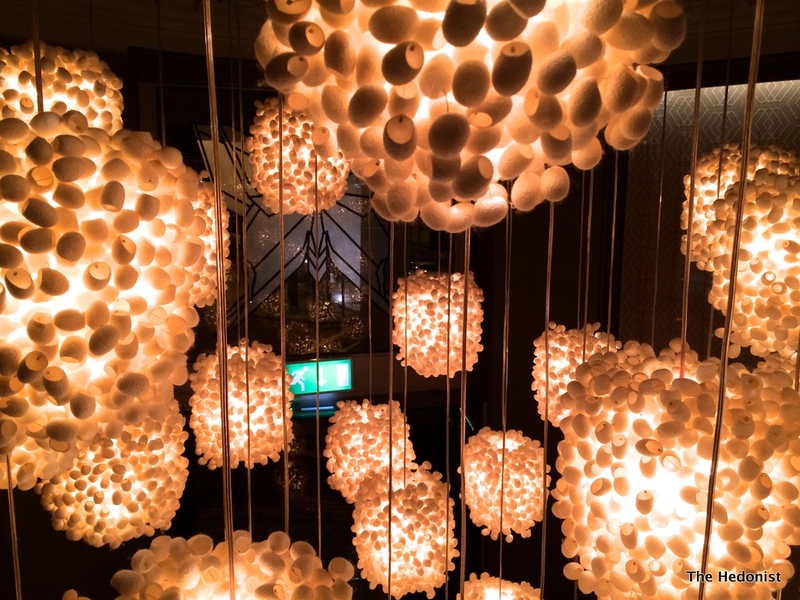 If you are interested in high-end contemporary Japanese food and have a budget you should try it. 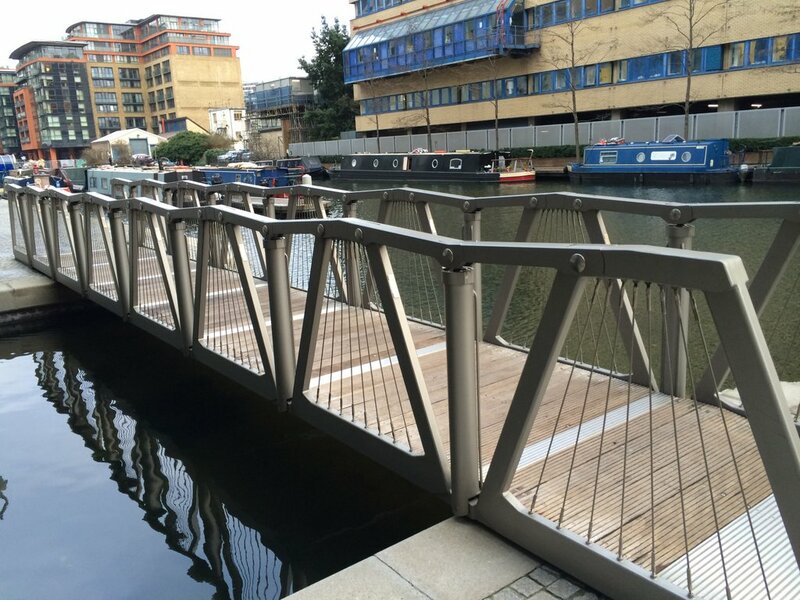 Hidden from the urban bustle of the Edgware Rd is a newly developed area of office blocks standing in serried ranks like steel and glass sentinels alongside the Grand Union Canal. Lovers of contemporary urban design will know it as the site of Thomas Heatherwick’s extraordinary rolling bridge, but we have come to eat and not to gawp having been invited to sample the food at See Sushi, Paddington’s waterside Japanese fusion restaurant. 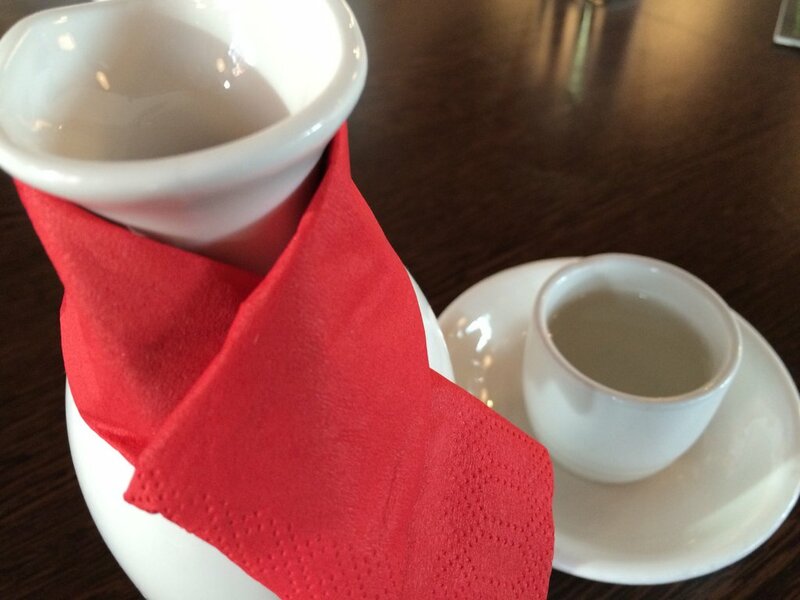 It is part of the See Woo business which alongside a huge Cantonese restaurant in Glasgow has a handful of oriental supermarkets and a large food produce and distribution business. 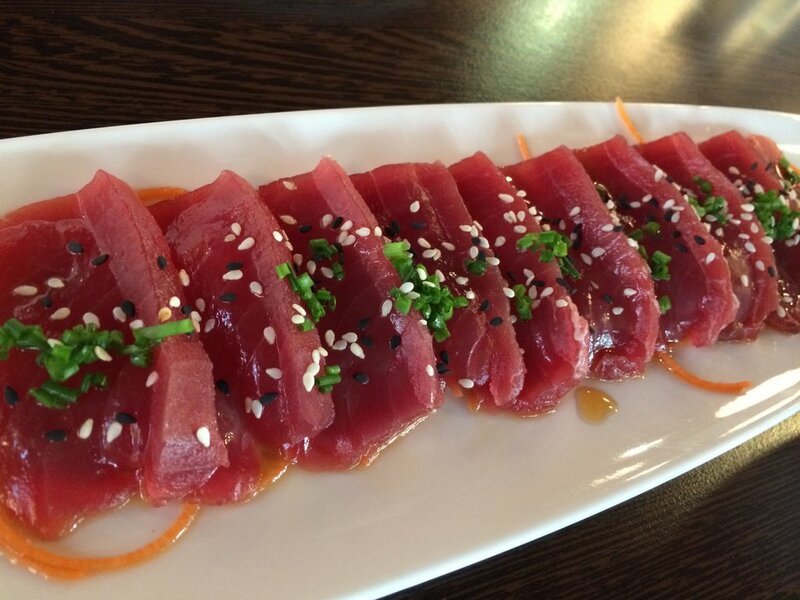 The menu offers a selection of Japanese favourites like sashimi, maki, tempura, donburi, miso black cod and bento boxes, as well as some Thai and Malaysian influenced dishes, but we are going to focus on the Japanese. 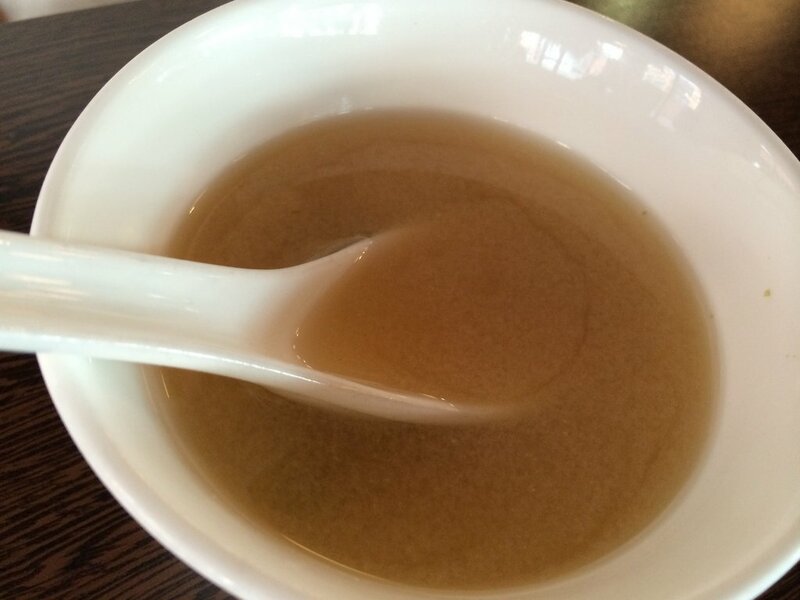 We start with an excellent bowl of Miso Soup (£1.95). It was really clean tasting, warming and not over-salted. Stomach suitably lined we ordered a large carafe of hot Gekkeikan Sake (£8.50). This was light and fragrant, perfect for the upcoming meal. 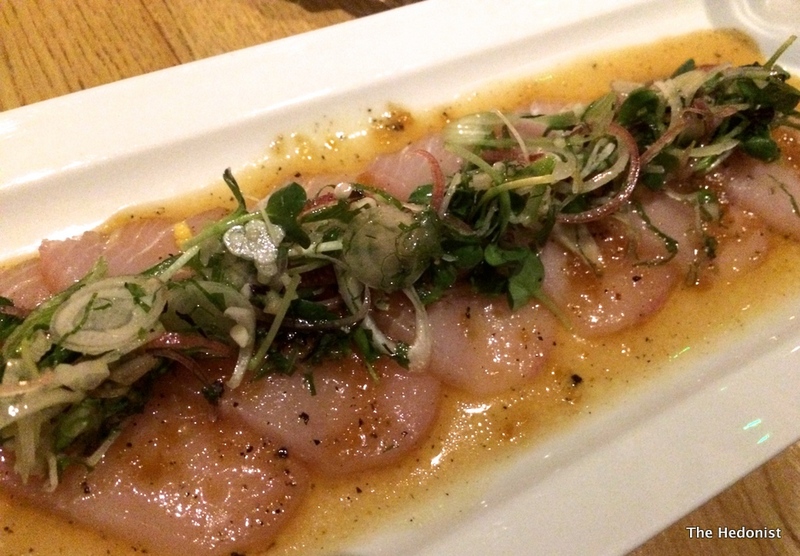 Maguro Carpaccio (£6.95) was a decently sized plate of raw tuna with a Ponzu (citrus and soy) dressing. The fish was lean and tender with great flavour and was well complemented by the sauce and the crunch of sesame seeds. Delicious. 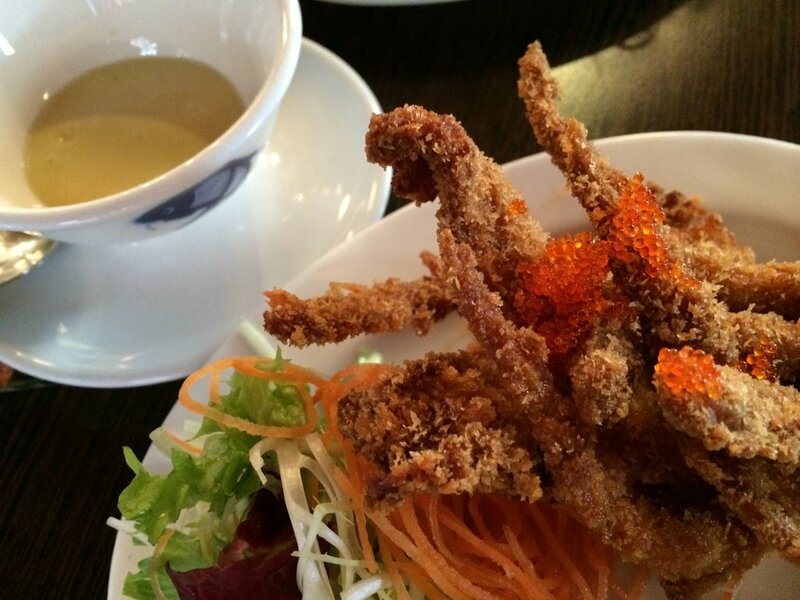 Soft shell crab (£4.95). The crab came deep-fried in breadcrumbs and with a mild wasabi sauce. The coating was crisp and grease free and the crab had plenty of taste. The Kyoto selection of Sushi (£10.50) has six pieces of Alaskan maki (seaweed wrapped sushi roll) and five of nigiri (raw fish on an oblong of rice). The nigiri in particular was excellent with good quality fish and fluffy rice. Black Cod marinated with miso (£15.50) came wonderfully caramelised and was a good size portion for a dish that you can pay more than double the price for in London. 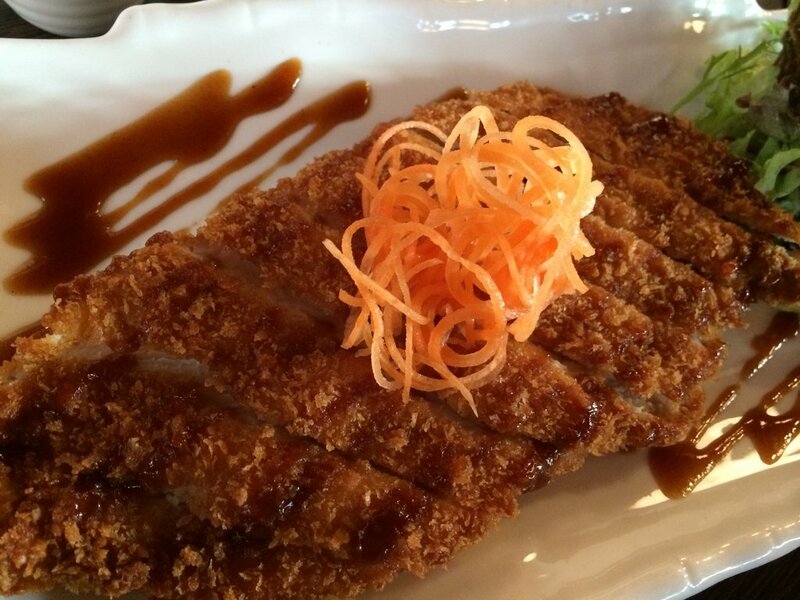 Tori katsu chicken (£8) is a Japanese take on a chicken escalope in breadcrumbs. It was a little dry but helped by its accompanying Japanese curry sauce. 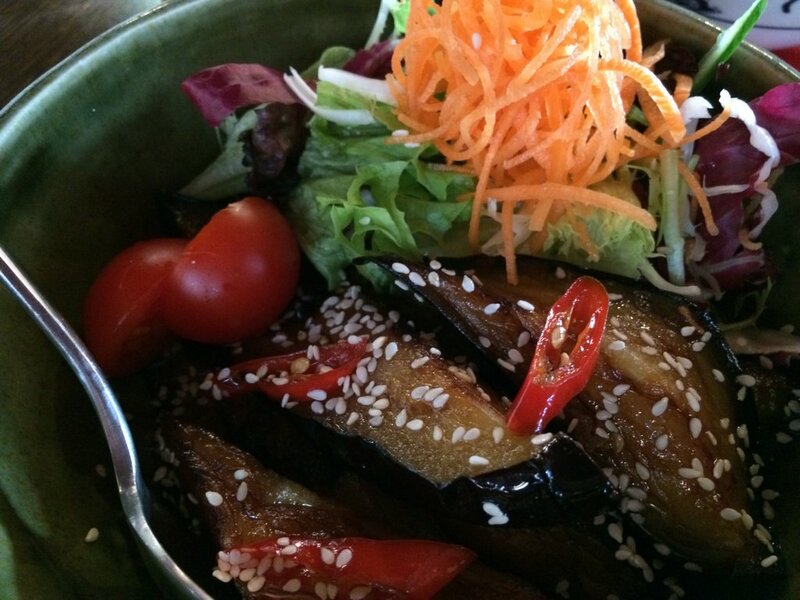 Pan-fried Aubergine with sesame oil (£6) was as soft and yielding as Nigella’s breasts…I love aubergine done this way. 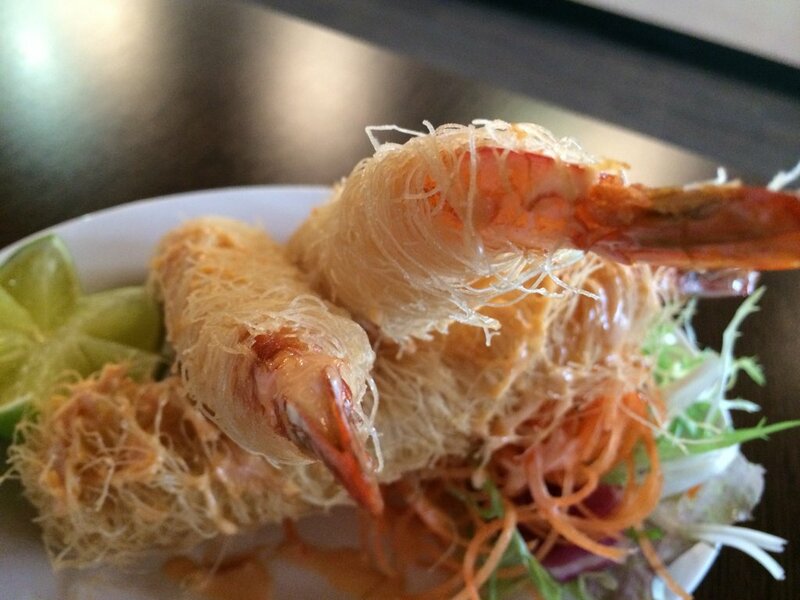 Chef’s Deluxe Ebi-deep-fried prawn wrapped in a kataifi pastry and served with a chilli mayonnaise. (£7.95). This was a beautifully presented dish with a good kick from the mayo. 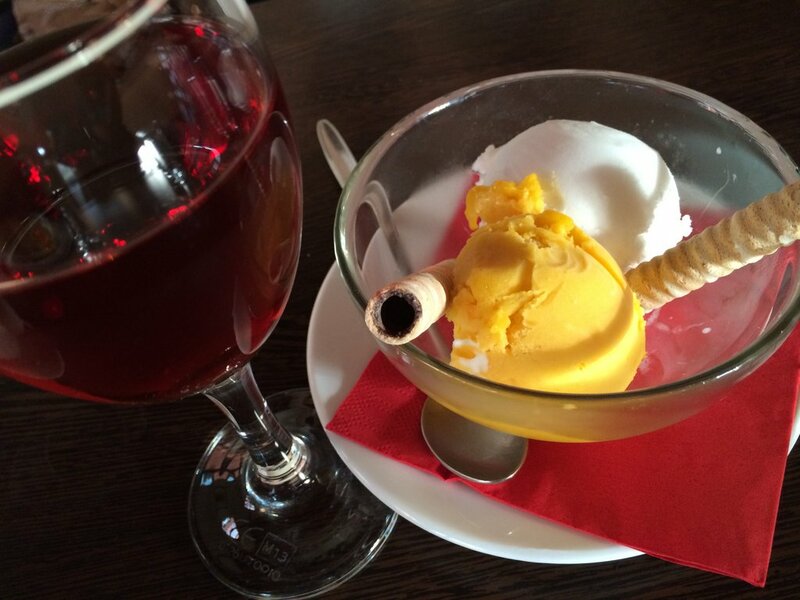 Having eaten so much it would have been foolish not to have dessert and a large glass of marzipan flavoured Plum wine (£6.50) Mango and lychee sorbets were perfect-not too sweet. 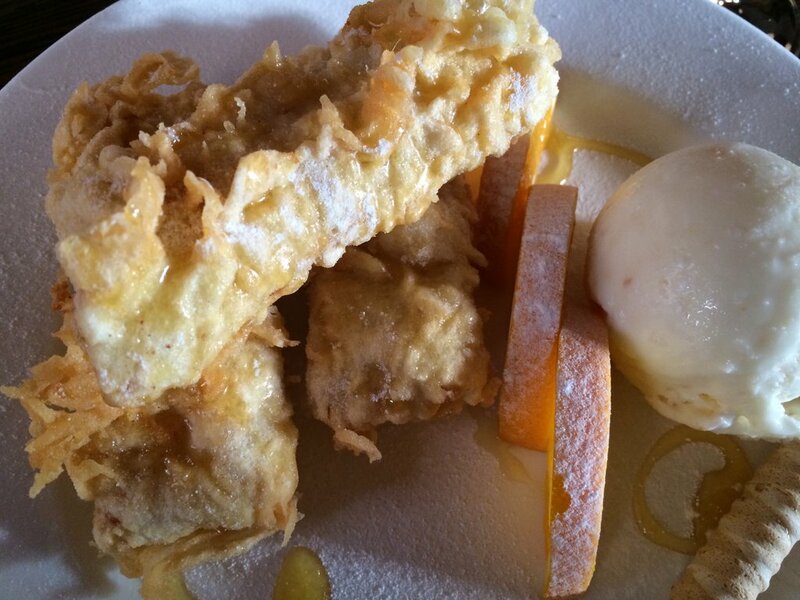 Banana fritters (£4.95) were slightly over-battered for me and needed to be really hot-they came with a scoop of coconut sorbet. Mango and lychee sorbets were perfect. Not too sweet. 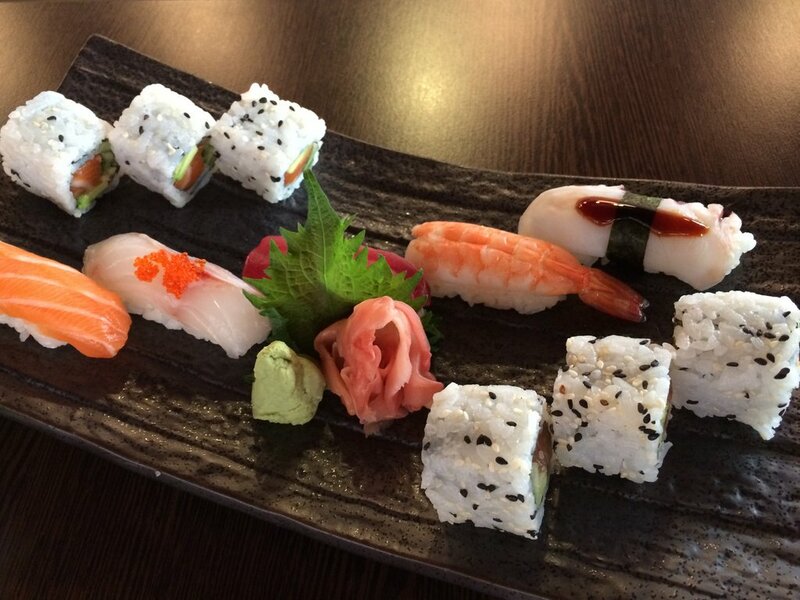 See Sushi is not pretending to be at the cutting edge of oriental fusion food but is offering good quality versions of menu favourites at a really competitive price point. It’s a great place to go with lots of friends or family.